Preity Zinta may have been staying in Los Angeles for a while now but she's still pretty desi at heart - there's proof in her new Instagram posts. 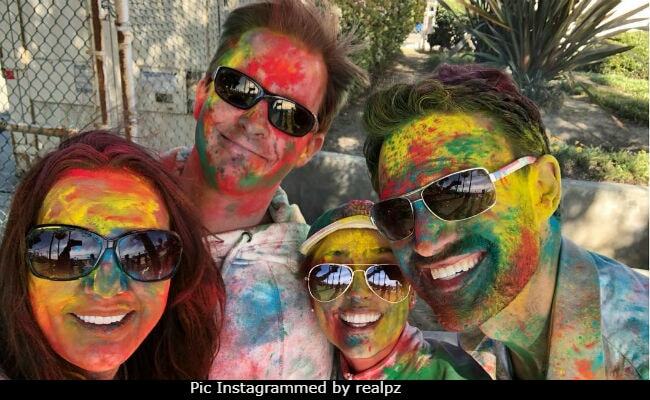 Days after Holi, the 43-year-old actress filled up her Instagram feed with colourful entries, also featuring her husband Gene Goodenough and a bunch of colour splashed faces. From her posts we know that Preity and Gene played Holi on the sun-kissed beaches of Los Angeles. In one of her posts, she wrote: "Nothing can beat Holi when there is organic colour, LA sunshine and desi music on the beach," while for another, she added: "Before & after the Holi party! Rang Barse." This is how Preity and Gene played Holi on the beach. On the day her fans played Holi back home in India, Preity appeared to be celebrating her second wedding anniversary. She also shared an adorable note for Gene along with an even more adorable selfie: "A lover, a partner, a husband, a best friend. I can't believe that I have all rolled into one! Thank You for always being so wonderful and yes, you're the only one I want to annoy for the rest of my life." Preity Zinta and Gene Goodenough dated for five years before they got married in Los Angeles in February 2016 and since then she's made it a ritual to post cute selfies with her husband on almost every special occasion. Here are a few from Preity's 43rd birthday and New Year celebrations. Preity Zinta shuttles between India and US throughout the year and was last seen in 2013's Ishkq In Paris, which she also produced. She is awaiting the release of the much delayed Bhaiyyaji Superhitt, which went in floors in 2014.